Every industry comes with its own language, so this is our version of printing 101. Can you scan and save my files to PDF? What is a Mobile Website & Why should I have one? Imposition - what does it mean in printing terms? How do I care for my Imprinted Tablecloth or Fabric Exhibit Material? What does it mean to score paper? Good question! We are a full service shop and offer a wide range of products and services. "Everything you need to market your business" To see a full listing and description of what we can offer you, check out the Products & Services area. Most applications will allow you to print to PDF or to export as a PDF. Resolution for photographs & graphics not containing type should be set to 300 dpi. Any files containing type should be saved as vector art (PDF or EPS) at last 800dpi to ensure sharp readable type. Pictures and graphics pulled from the internet are often low resolution, typically 72 dpi or 96 dpi. Avoid these graphics, as they will appear pixilated and fuzzy when printed. 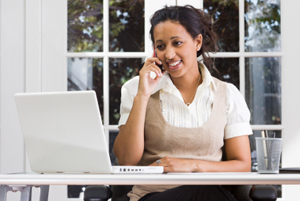 Contact us with any questions or clarification you may need- We will be happy to help you! A proof is a copy of your document after all modifications and printing setup processes have been completed. It is your LAST and BEST opportunity to check everything and make sure that the print job comes out the way you want. By carefully inspecting the proof, you can help us assure an accurate printed piece. Attention to detail is the key to successful proofing. Is the color accurate, pleasing? Are bleeds, perforations and folds indicated properly? Are elements aligned at the tops and bottoms of sections or pages? Portable Document Format (PDF) is now an open standard for electronic document exchange maintained by the International Organization for Standardization (ISO). When you convert documents, forms, graphics, and web pages to PDF, they look just like they would if printed. You can view and interact with PDFs on virtually any platform, including Windows®, Mac OS, and mobile platforms including Android™ and iOS for iPhone and iPad. * A Locked file format, which can eliminate file variations due to platform, software or version issues. as long as fonts are embedded or outlined. * A compressed file format, which means smaller files and faster upload times in single file format, which makes for faster and easier uploads. A PDF helps to insure that your job proceeds quickly, smoothly and with no unexpected "surprises." Monitor calibration, lighting and the use of Pantone® colors can affect the color fidelity of PDFs and JPEGs. Not typically. Because white is the default color of paper, it is simply recognized as the absence of any ink. Printing white ink on colored paper is not advised. Absolutely! We take very seriously our role in preserving the environment and integrate numerous green practices into our daily operations. In addition to energy-efficient equipment and soy based inks, we can perform many print jobs using recycled paper stock. We use papers supplied by Forest Stewardship Council® (FSC)certified vendors. If you would like to use recycled paper for your next print job, let us know. In today's world, organizations have the benefit of interacting with their customers in ways never before possible. In fact, the most cutting-edge companies actually engage in a two-way conversation with their targeted audiences, using technology like personalized URLs to provide ultra-personal communication that lets people know you value them individually. One of the most powerful words you can use when marketing your products and services is your customer's name. Yes. We can scan documents & save to PDF for compact storage & email them to you or burn to a CD. We can also scan artwork and save electronic versions (PDF, TIF, JPEG, etc.) & email them to you or burn to a CD. A unique barcode, that when scanned with a smartphone with QR scanning software/app, quickly directs customers to a specific webpage or contain a phone number, an SMS message, designed with a targeted message. You can use it to make your printed materials interactive. This may include business cards, flyers, brochures, signs, clothing and other items. Your customers, prospects, and other associates will have all of your contact points at their fingertips on their mobile device. A mobile website is usually a mobile version of a company's existing site, but is formatted so that it is easy to view with smartphones, tablet PCs and other mobile devices. In many cases, however, organizations choose to develop unique mobile experiences tailored to customers who are constantly on the go. Social media is a catch-all term for sites that may provide different social actions. For example, Twitter is a social site designed to let people share short update messages with others. Facebook, in contrast is a full-blown social networking site that allows for sharing updates, photos, joining events and a variety of other activities. Imposition is one of the fundamental steps in the prepress printing process. Converting the file from "Reader Spreads" to "Printer Spreads"
It is the page set up to go to press & be backed-up and in the proper order to for binding, etc. Correct imposition minimizes printing time by maximizing the number of pages per impression, reducing cost of press time and materials. Readers spreads show consecutive pages in two page spreads. They are in the correct order for someone to read the document. This is typically how a document is set up when you are creating it. However, when you send the document to your Printer/ Service Provider they will need to convert the file (Imposition) to Printer Spreads so that it prints in the correct order. Printer spreads are not in consecutive page order, they are in proper order for the printer so that when the document is printed, trimmed, assembled, folded and stitched together, all the pages will back up to each other properly & appear consecutively. Click on the link above to Download the Care Instruction Sheet for Imprinted Fabric Exhibit Material. Scoring is a deep indent or crease put in the paper where it needs to be folded. Scoring the paper enables easy folding and a professional look. Typically thicker paper needs to be scored so that it does not crack. Vector art is created using illustration software programs like as Adobe Illustrator and Freehand. These programs use mathmatic equations and geometric primitives (points, lines, and shapes) to create art that is clean, camera ready, and can be scaled infinitely in size without any loss of quality or clarity. In a Raster art file, the edges of the art become distorted & pixelated when the picture is enlarged. The edge is choppy or fuzzy. Raster Graphics, such as photographs, and graphics files created in Adobe Photoshop, Paint Shop Pro, and other Raster editing programs, can be used for some applications but in most cases, especially with logos you need Vector art for clean, crisp printing at any size or use. 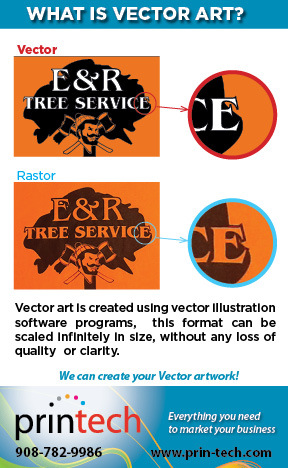 Vector art can be saved in other file formats (such as .eps or .pdf). But, it is important to remember that just because a file is saved in one of these formats, that does not mean that it is truly vector art. Only art originally created in a vector program like Adobe Illustrator, it true vector art. There are some file formats that can only be Raster art, and therefore cannot be Vector art. The most common examples are .jpeg, .png, .bmp, .gif, .psd, .tif. These files cannot be vector art. The best way to find out for sure is to ask a graphic designer to check the file for you. Printech can check your file for you! 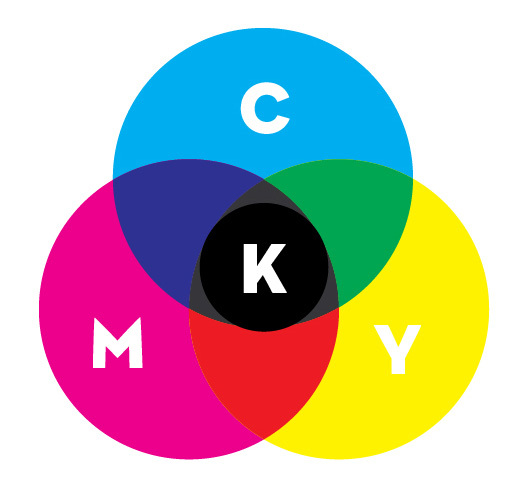 CMYK refers to the four inks used in color printing: cyan, magenta, yellow, and key (black). CMYK color (process color, four color) is a subtractive color model, used in color printing. A typical rich black mixture might be 100% black, and a lesser percentage of each of the other three inks (Cyan, Magenta & Yellow). This results in a darker than black tone "Rich Black". 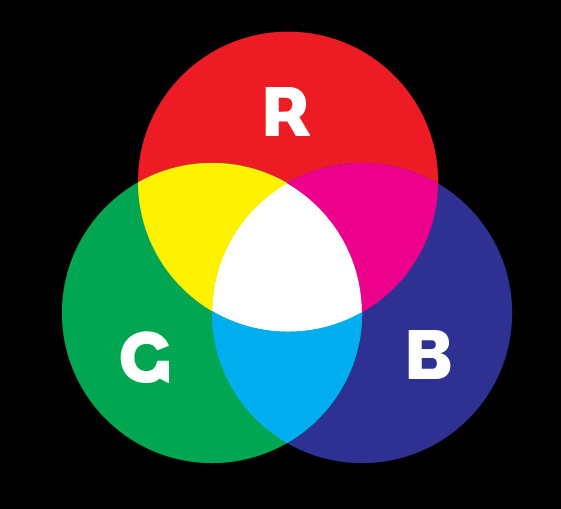 RGB comes from the initials of the three additive primary colors, red, green, and blue. The main purpose of the RGB color model is for the sensing, representation, and display of images in electronic systems, such as televisions and computers, though it has also been used in conventional photography. RGB is not used in printing and when printed on CMYK device can result in a dark or muddy print. To print on a four-color press, all RGB files must be converted into CMYK color.